Keep up-to-date with the performance of your super or Retirement Section account. ANZ Staff Super offers members the choice of four investment options. You can invest your super or Retirement Section account in one or any combination of the four available options. Each investment option has different investment objectives, asset allocation and risk and return expectations. The majority of assets are invested in shares with small allocations to property and alternative investments. (A MySuper product) Typically around 65% is invested in shares and property and around 18% is invested in alternative assets. Typically around 60% is invested in diversified fixed interest securities and cash. 100% is invested in short-term money market securities and fixed interest securities with short durations. Log in to your account, click ‘Investments’ on the dashboard and see the description; objective; standard risk measure; minimum suggested timeframe; asset allocation; and recent investment performance for each investment option. Super members who do not make an investment choice will be invested in the Balanced Growth option (the default option). Retirement section members who do not make an investment choice will be invested in the option(s) that most recently applied to your account balance in the Employee Section, Employee Section C, Personal or Partner Section (whichever is applicable). For more on information on each of ANZ Staff Super’s investment options and what to consider when making an investment choice, read the PDS relevant to your section. Generally, all investments have the potential to increase or decrease in value, or stay the same. An increase in value generates a positive return while a decrease in value generates a negative return. Generally, the greater an investment’s potential return, the greater the risk associated with that investment. 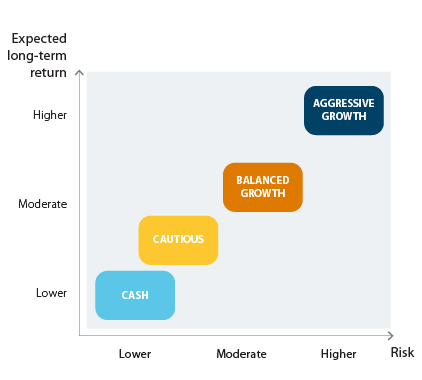 Each of ANZ Staff Super’s investment options has a different mix of risk and likely return as illustrated below. You should be comfortable with the level of risk associated with the investment option(s) you choose. What are the risks associated with investing? All investments, including super and Retirement section accounts, carry a degree of risk. The most common types of risks are listed below. Inflation may exceed the rate of return on your investment. Individual assets can and do fall in value for many reasons, such as changes in its internal operations or management or in its business environment. Changes in economic, technological, political or legal conditions and in market sentiment can impact on investment markets and affect investment returns. Market risk is managed by appropriately diversifying the Scheme's investments both within and between asset classes and markets as part of the strategic asset allocation. For international fixed interest securities, the Trustee's policy is to have a full currency hedge so that investment returns relate solely to the performance of this asset class. Risks associated with derivatives include the value of the derivative failing to move in line with the underlying asset, illiquidity, inability to meet payment obligations as they arise and counterparty risk. The Trustee does not directly invest in derivatives such as futures and options, but does use foreign exchange forward contracts for hedging. Investment managers may use derivatives in managing portfolios for the Trustee and in managing pooled investment vehicles in which the Trustee invests. Derivatives are used to reduce risk, reduce transaction costs and as an efficient way of gaining exposure to certain asset classes. Limits on the extent of derivative use are specified in the investment management agreements between the Trustee and investment managers. Risks particular to the Scheme include closure of the Scheme, Trustee changes and investment manager selection. Superannuation law changes often. These changes may affect your investment. Taxation law changes often. These changes may affect your investment. Liquidity risk is the risk that the Scheme will encounter difficulties in meeting benefits and other financial obligations because it is unable to realise investments in a timely manner. Liquidity risk is managed by monitoring the Scheme's holdings in illiquid assets. The assets deemed most illiquid are limited to 14% of the total market value of the Scheme's assets. Other assets are held in readily realisable assets which are actively traded on exchanges such as the Australian Stock Exchange. The Scheme also has limited ability to borrow in the short term to ensure settlement of financial obligations. Credit risk represents the loss that would be recognised if counterparties failed to perform as contracted. Concentrations of credit risk are minimised by investing in various unlisted unit trusts which in turn hold diversified direct market investments. These unit trusts undertake transactions with a large number of counterparties on recognised and reputable exchanges. Changes in interest rates may impact on investment returns. For more information on the risk and return of each of ANZ Staff Super’s investment options, read the PDS relevant to your section. ANZ Staff Super’s investments are managed by professional investment managers. The Trustee is responsible for manager selection and monitoring their performance. The following table shows the asset classes that ANZ Staff Super invests in and the investment managers appointed to each asset class. Note that this information is correct as at June 2018. The Scheme's cash holdings are held with ANZ. You can change your investment selection weekly at no cost to you. This is known as ‘switching’. You can also choose to place your current account balance in more than one investment option in any proportion you wish. If you are a super member you can choose to direct future contributions and other cashflow (such as rollovers) to more than one investment option in any proportion you wish. If you are a Retirement Section member you can choose to have future cashflows (such as income payments) drawn from one or more investment options if you’ve chosen a combination of investment options for your account balance. While you can change your investment selections weekly, you should think carefully about making any changes based on your reaction to short-term fluctuations in the value of your investment. Super is generally considered to be a long-term investment in which you should take a considered long-term view of investment markets. Log in to your account, click ‘Investments’ on the dashboard. Press ‘edit’ if you wish to change any of your current investment or future contributions investment options. As your circumstances change, you may need to review your investment options. But before you make a choice, you should seek financial advice from a licensed financial planner. You can contact an ANZ Staff Super financial adviser on 1800 000 086 who can give limited financial advice over the phone. The table below shows the investment returns for Employee, Employee Section C, Personal and Partner sections of ANZ Staff Super, and from 1 July 2017, members with Transition to Retirement pensions. The table below shows the investment returns for Account Based Pension members of ANZ Staff Super. Important Note: Past performance is not necessarily a guide to future performance. This investment returns information has been prepared for the general information of members of the Scheme. It does not take into account any member’s individual financial objectives, financial situation or needs. We recommend that you seek help from a licensed financial adviser before acting on any of this information. While all due care and diligence has been taken in the preparation of this information, the Trustee reserves the right to correct any errors or omissions. Your ANZ Staff Super account is recorded as a unit holding in one or more of the underlying investment options. Each investment option has a unit price. The unit price of a particular investment option is the value of its net assets divided by the number of units on issue. The “value of net assets” is the current market value of assets in an investment option, after deducting current liabilities such as accrued investment tax (where applicable) and investment related expenses. Unit prices are set weekly or, in certain circumstances, more frequently as determined by the Trustee. As asset values fluctuate, unit prices will go up and down. The investment return for each investment option is calculated as the percentage change in unit prices for the year, to provide a measure of investment performance. To check current or historical unit prices of ANZ Staff Super investments go to the account login page. Click either the ‘Unit Prices Super’ or ‘Unit Prices Pension’ button and submit a date to show unit prices for that day. You can also check unit prices when logged into your account by clicking ‘Investments’ on the dashboard, scrolling down to ‘Unit Prices’, and submitting a date to show the relevant unit price. You can also click on your investment options to see current number of units and the current price. Get the advice you need before you make an investment choice or switch investment options. You can contact an ANZ Staff Super financial adviser on 1800 000 086 who can give you limited advice on the investment options available and your investment strategy.